A bowl packed with nutrition and bursting with flavor, this spicy salmon and avocado poke bowl makes for a quick, healthy and satisfying weeknight meal. 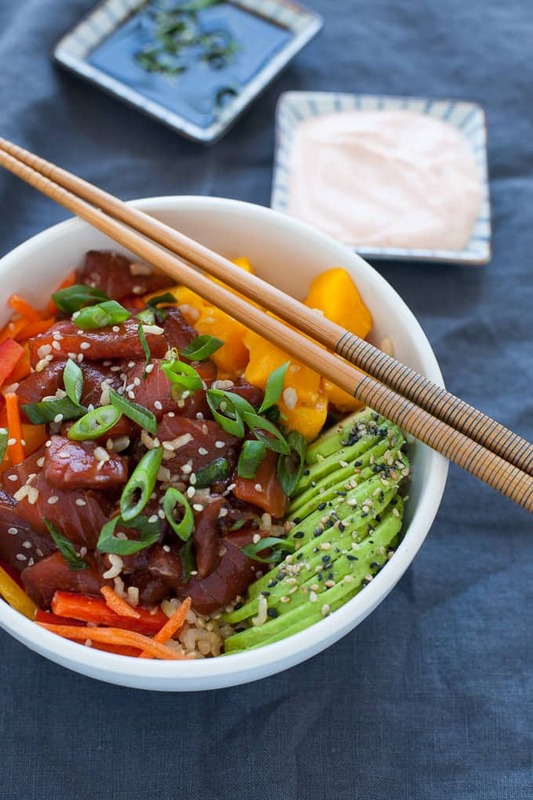 Poke was all the rage last year, making all the 2016 food trend reports. So I guess I’m a little behind on the trends posting a poke bowl in 2017 but sometimes it takes me a while to catch on. Or, maybe I just like foods better when they aren’t as trendy. You can find me posting a sweet potato toast recipe in 2018 ;). But I do see the appeal of the poke bowl; I mean, what’s not to love? As a sushi enthusiast, I fully support bowls that are piled high with raw fish and veggies. Originating in Hawaii and made popular in California, poke joints are slowly starting to pop up around the country. 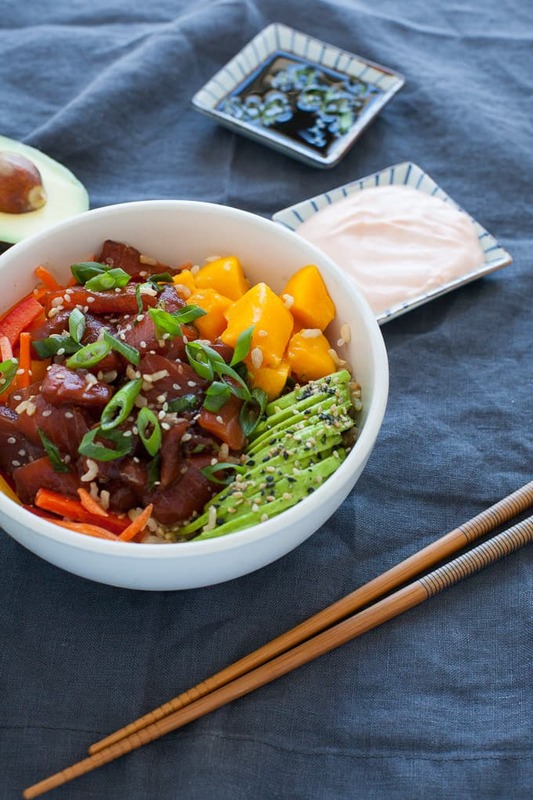 But why venture out when you can easily make a poke bowl at home?! Poke bowls are so easy to customize. Make your rice of choice (brown, sushi, white, maybe microwave some frozen rice to save time), buy some quality sushi-grade raw fish like tuna or salmon and then top with whatever crunchy raw veggies you have in store (peppers, carrots, cukes), maybe some tropical fruit like mango or pineapple, and some avo for good measure. The spicy mayo is super easy to make at home too – all you need is sriracha and yogurt (or mayo)! You might also find that you already have most of the ingredients that you need at home! 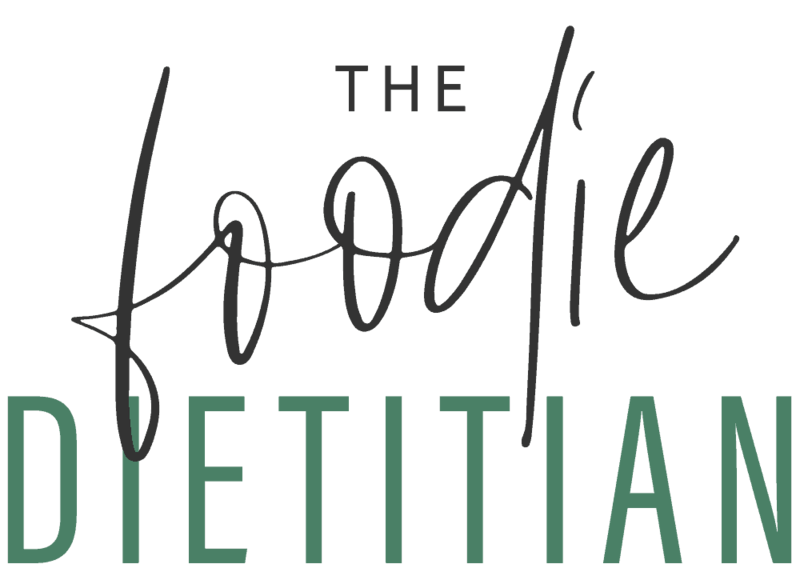 This month’s Recipe Redux theme was to spring clean the kitchen and come up with a recipe where you already have at least 3 ingredients at home. Well I always have frozen brown rice in the freezer as well as frozen fruits like mango (mostly for smoothie making), always have avocado in the house as well as soy sauce, sesame oil, rice wine, Sriracha and Greek yogurt! I made these bowls for a weekday lunch and I felt like a queen eating this for lunch (because usually I eat scrambled eggs and veggies lol). It tasted so fresh and light and satisfying with all the different textures. The umami flavor of the soy sauce marinade and the spicy creamy dressing all came together beautifully to highlight the fish and veg. Plus, the salmon provides healthy omega-3 fats and the avo packs in good-for-you monounsaturated fats. 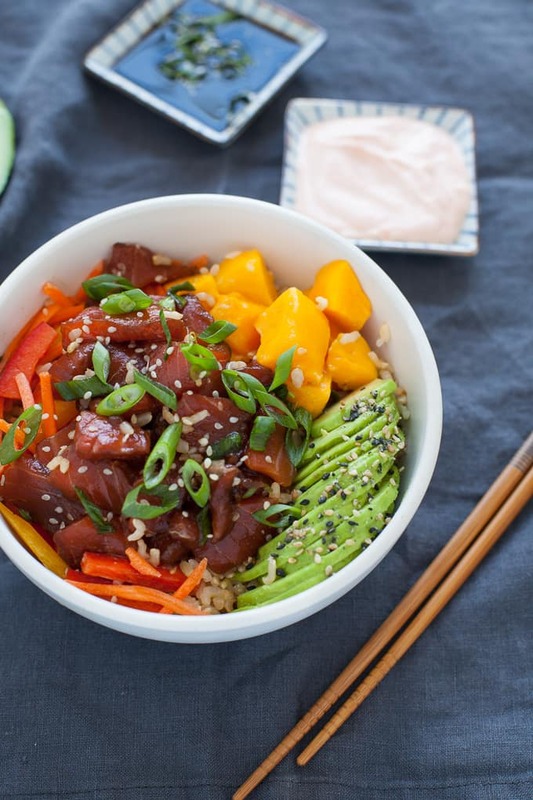 I will definitely be making this again soon for a weeknight dinner because we are sushi fiends at our house and this poke bowl is kind of like a sushi lover’s dream. One chopstick full in, you’ll be dreaming of the beaches in Hawaii and maybe even do a little hula dance. Cut salmon into small chunks. In a small bowl, whisk together soy sauce, ginger, mirin, sesame oil, sesame seeds and scallion. Add salmon to bowl and toss with marinade to coat. Refrigerate for 30 minutes. 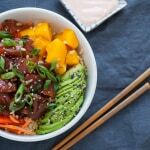 Assemble your bowl, layering brown rice, carrots, bell pepper, avocado and mango. Add salmon and garnish with extra scallion and sesame seeds. Add spicy mayo sauce over top. Whisk together Sriracha and Greek yogurt until combined. Spoon over poke bowl. Tell me, have you ever tried poke? Are you a fan? I think I’m a bit behind the trends too; never had a poke bowl. Think your poke bowl is going to change this. It looks and sounds amazing. What a great idea, especially for sushi lovers. Pinning!!! Thanks Claire! It’s SO fabulous! Thanks Farrah! 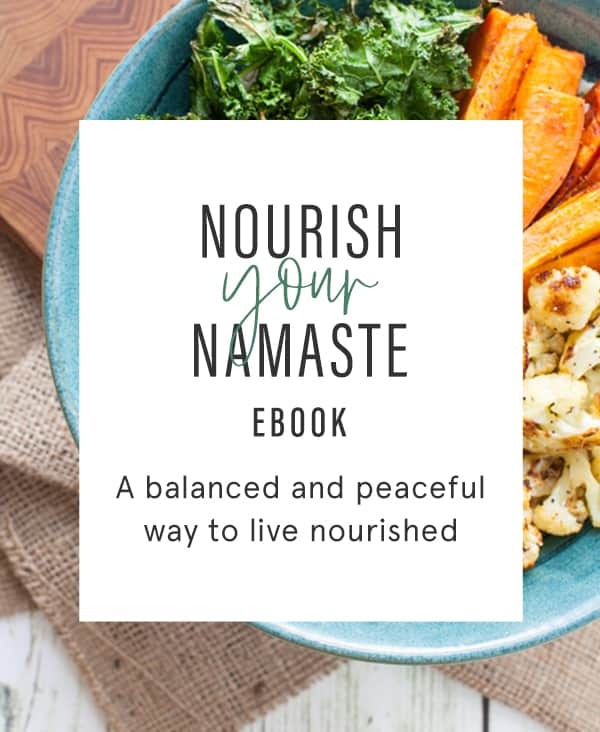 I just love this recipe 🙂 hope you do as well! Love me some poke! We love sushi but it gets so expensive so this a great way to not only make my own and save some money, but add a ton more veggies! I hope you like it! Poke is one of my favorite things to eat! Stunning bowl!! Gosh this makes me miss salmon sashimi … 4 more months! Cannot wait to make this, hubby would love it too. Thank you! You guys will love it–poke is one of my favorite things to eat! I LOVEEE poke bowls, but I’ve only ever got them at a restaurant. What am I waiting for? I need to make this at home! These are beautiful! The combination looks wonderful but as you said trends are made to be broken so my salmon will be grilled! Thank you for sharing! These look AMAZING! I was so excited when a poke restaurant opened up near me, but found the sauces they use there to be too overpowering. 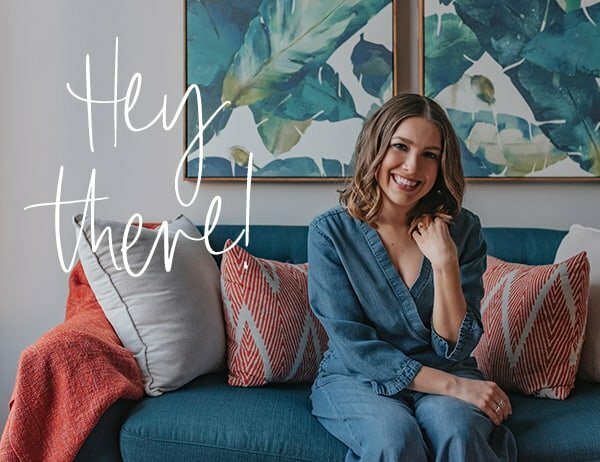 Love the idea of making it at home instead! Thanks! I hope you love it as much as I do!